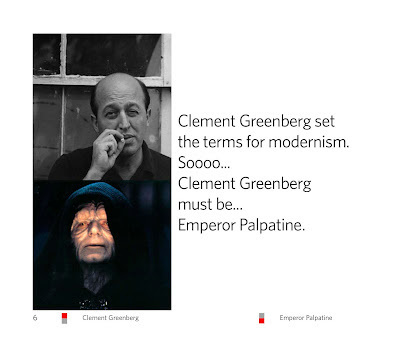 Some details about Clement Greenberg: In the late 1950s and early 60s he was the lion of the American Artworld - a world that didn't exist before WWII. Greenberg is worth knowing because, as villainized as he is in artworld circles, he was in fact a first rate thinker and an excellent writer. His essays Avant-Garde and Kitsch and Modernist Painting are excellent introductions to ideas. Thierry De Duve's book Kant After Duchamp is a rigorously critical, but not unfriendly study of Greenberg and the issues he made central to art. For those interested in the formation of the New York artworld I recommend How New York Stole the Idea of Modern Art by Serge Guilbaut. 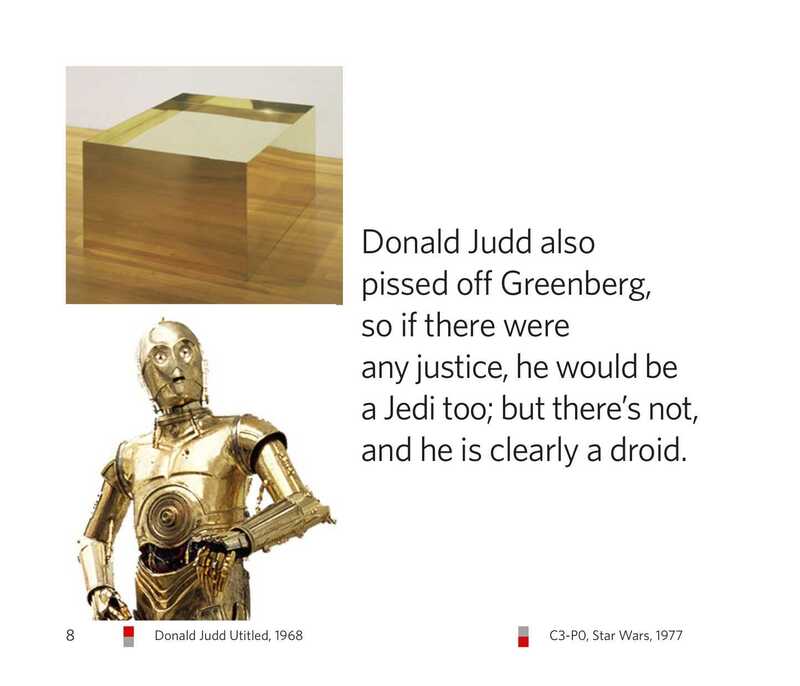 Although I am not a fan of Greenberg's followers (or even of the many of the artists he championed), And while I do no subscribe to his ideas, I very much do admire his thinking. Jerry Saltz like to complain against artists and academics who's interests in art remain anchored in the art and writing of the 1960s, but there is a good reason for American thinkers to have their foot nailed to the floor at that moment. For one, it is what Hal Foster calls the "Crux" that contemporary art turns on. 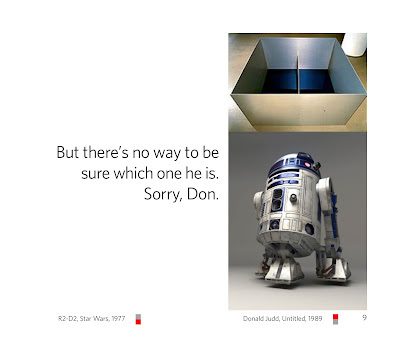 The "crux," is that up until then, Greenberg and his followers had (very convincingly) argued that paintings should be looked at with as non-illusionistic objects (painted surfaces supported by frames). But starting in the early-1960s artists began to challenge the status quo is a subtle way. Greenberg had successfully argued that paintings should be looked at as objects, but now artists began to make objects that were meant to be looked at like paintings... that is the "crux." Judd really initiated the challenge to Greenberg, although Frank Stella's Striped paintings were the true origin of the "crux" - Judd was arguably the first to articulate the shift. Judd began his career as an art critic, but became one of the most important artists of his generation. 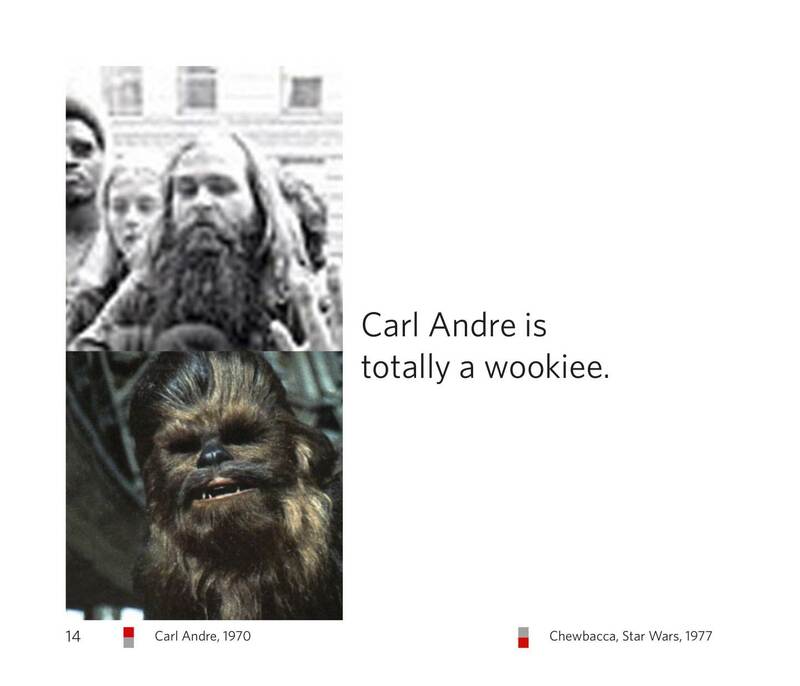 His most important essay was "Specific Objects." Unfortunately Judd's writings have not aged very well. I have never enjoyed him as a stylist and find his logic muddy, his arguments poorly structured, and his concerns and subject matter dated. 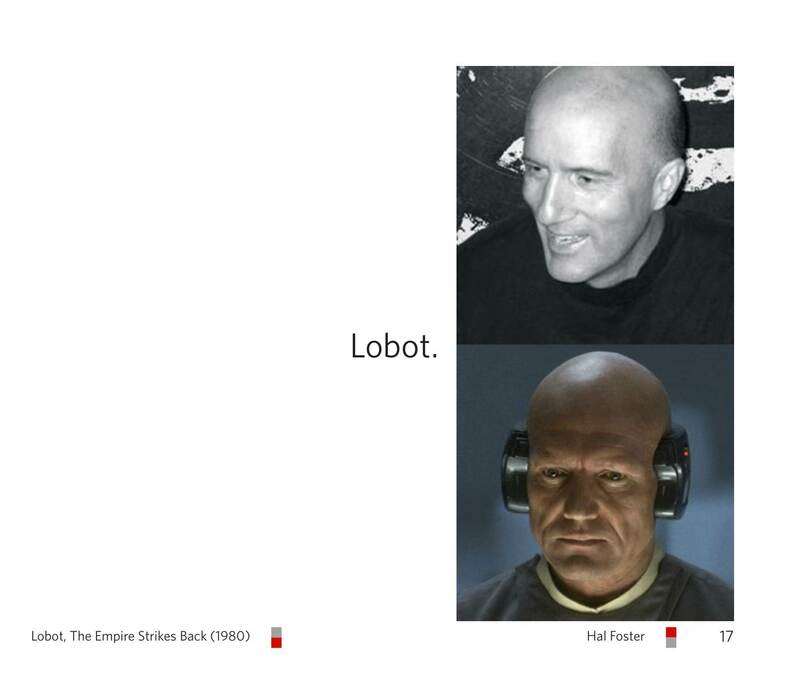 Droid. 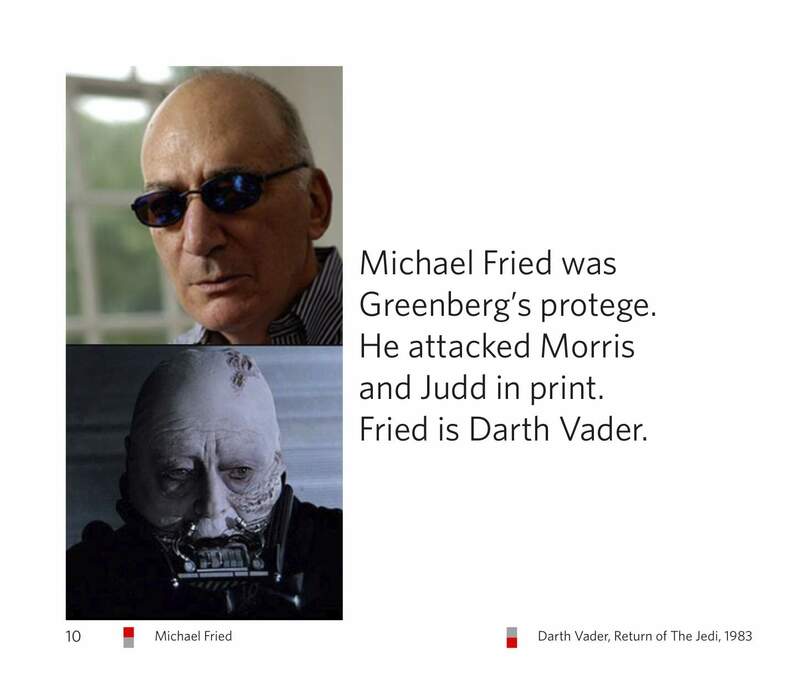 Fried is still alive - I think he is a poet or something - but his great contribution to our story was going to bat on Greenberg's behalf. He attacked Judd and Morris in print in an essay called Art and Objecthood where, by all accounts, he got carried away. (I seem to remember Greenberg was even a little uncomfortable with how far he took his arguments. Although Objecthood crossed the line into quasi-mystical formalism it is well written and entertaining. Whatever else hi is, Fried is an excellent writer. 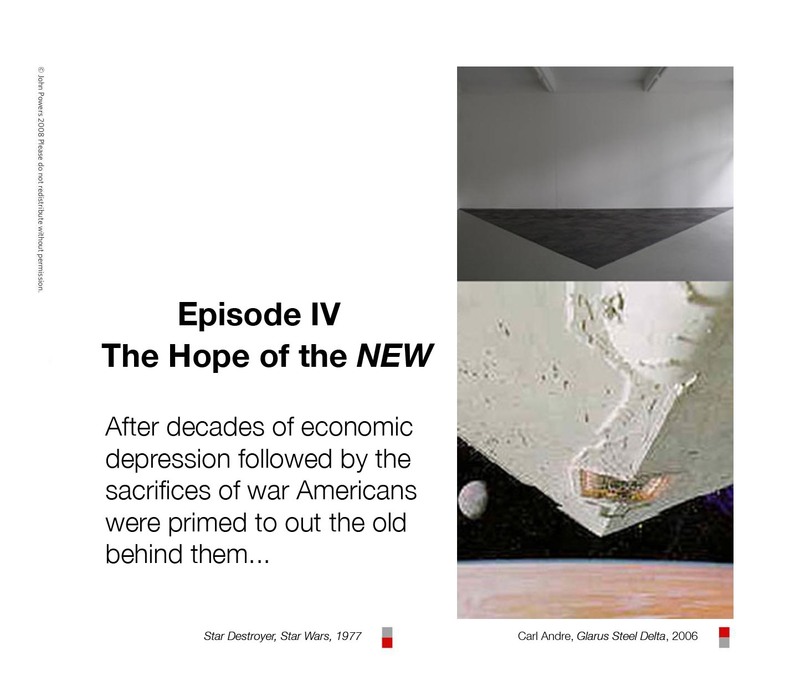 Krauss was introduced to Greenberg by Fried, but she broke with them and, in 1978, ended up writing an essay title Sculpture in the Expanded Field. 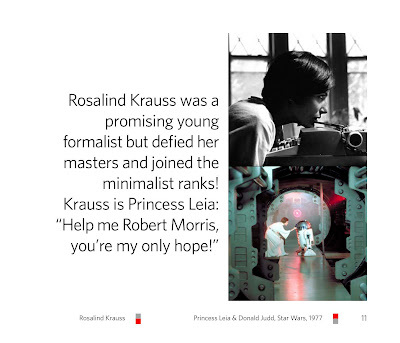 Krauss is one of the first to use the term "postmodern" - although the postmodernism of expanded field still feels solidly formalist (she is entirely focused on apolitical aspects of abstraction). And just as the obvious hier to Emperor at the end of Jedi is Leia, if Greenberg has an hier it is Krauss. She went on to found the journal October, became a powerful and influential theorist and academic in her own right and mentored many of the artworld's most influential theorists to boot ("There is another" indeed). Krauss has been mentioned repeatedly on this blog. For those interested they can find my posts about her HERE. 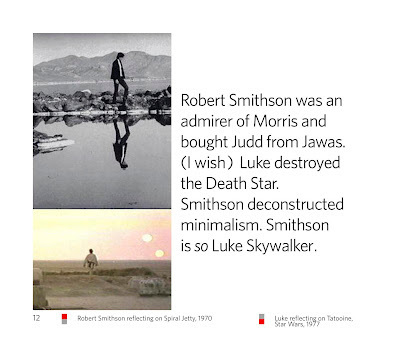 Robert Smithson was a good bit younger than Judd and Morris, an admirer and friend of both. Many of his is writings are "postmodern" in the sense that most contemporary readers would recognize as postmodern: mixes of highbrow subject matter and lowbrow ephemera, strange fragmented structures, copious citations, and a linguistic as well as visual playfulness entirely alien to the formalist cannon I've outlined thus far. Because smithson lampooned Fried's Art and Objecthood in a now-famous letter to the editor to Artforum magazine, and fried has call Smithson's critique the best criticism he has ever received (impressive, since I'm guessing it is a fairly enormous pool) The essay that seems to get the most air play in undergraduate art programs is Quasi-Infinities and the Waning of Space (I suspect because it has lots of pictures). I think this is akin to throwing begining swingers into the deep end however and like to suggest Thought on a Proposal for a Termina Site. Smithson's career was cut short by an airplane crash, but for many people in the artworld he was the great mind of his generation - the promised one, who could bring balance to a fragmenting artworld. 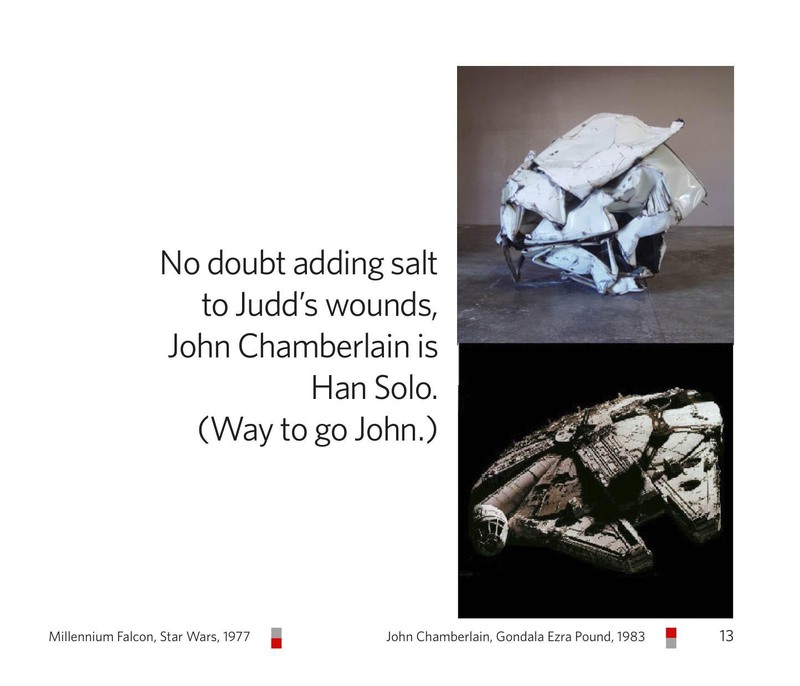 No metaphor is perfect, and Han Solo is hard to nail down - he is a figure that bridges the Modernist machine world of Leia and Vader, and the dusty vernacular of Luke and Obi Wan.. I have described the Millenium Falcon as the first flying saucer imagined, not as a Modernist Utopia, but as a modern slum. 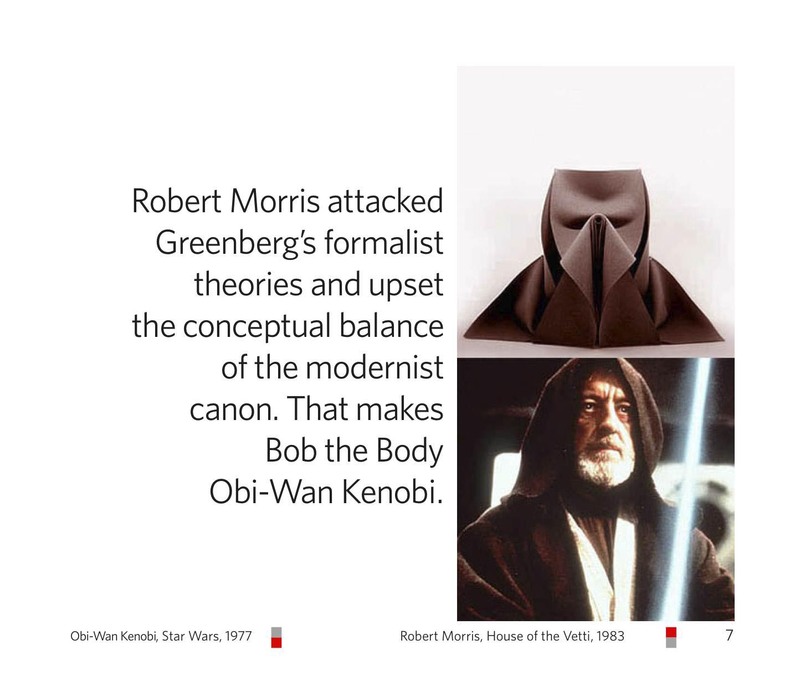 Chamberlain's work not only looks beautiful next to the Millenium Falcon, his recent retrospective at the Guggenheim showed a career's worth of work was simultaneously a heroic Modernist figure but simultaneously, out-side or at-odds, with the Modernist cannon. 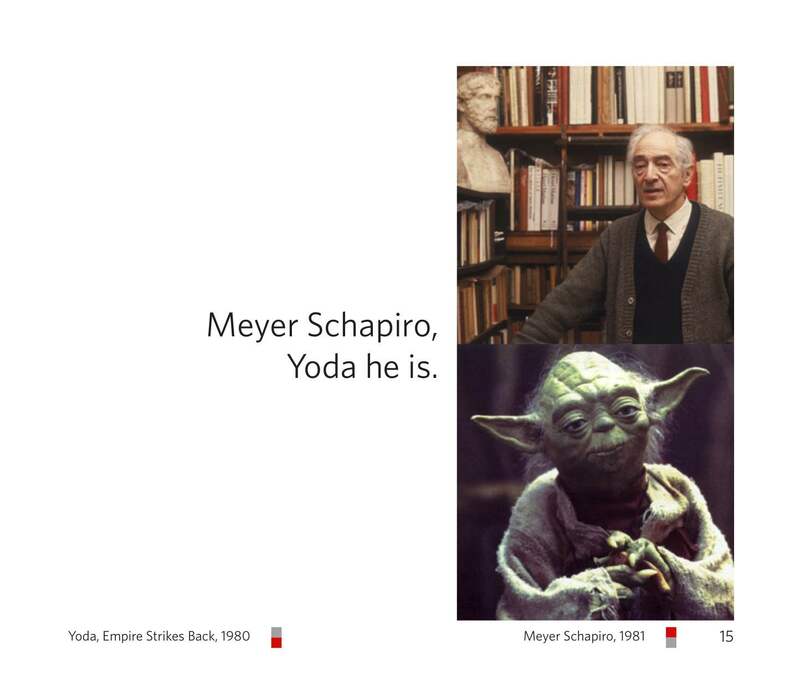 And while Meyer Schapiro is a fantastic visual match to Yoda he is also a great match up conceptually. Just as Yoda turns out to have been the Emperor's oposite number, Shapiro was, especially in the early years, Greenberg's most obvious counterpoint - believing abstract art should be understood in a social/political context. Like Yoda he was important early on - he is an anti-deluvian figure that fades from relivance after the war. 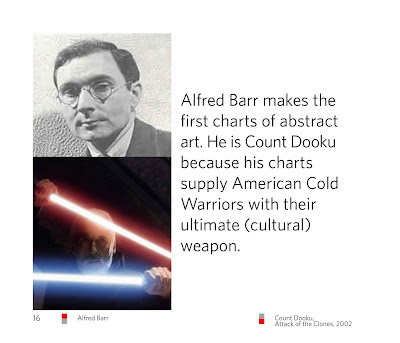 His essay "The Nature of Abstract Art" is an excellent introduction to his ideas.